Attached Carport by Extreme How-To. 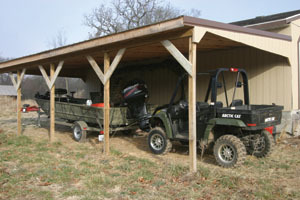 For the designs to this carport see the list of carport designs below. So we have gone through the initial questions of design and you should now have spoken to the council and be ready to prepare formal plans if required. But before we get down to choosing a plan in order for you to build the carport yourself, lets recap on our checklist. Have a decent picture in your mind about how you want your carport to look, how high it will be and how long, is it single or double, etc. Measure and confirm where it will go and that it fits. Also measure the distances to the nearest boundaries or other structures. Talk to your neighbours and get their confirmation that they do not mind your new structure. Speak to your council and get information including any restrictions with your building and what you need to supply to the council if you do need to apply for council approval. Select your design and modify it to suit your look. Choose your materials ensuring these are in line with council requirements. Go for durable material that suits the environment you live in. Draw up your plans showing both the design and measurements and note on the plans your materials. Your diagrams will need to be quite detailed. Invite your mates over and have a ‘build a carport’ weekend! In Building a Carport Part 1 we looked at items 1-3 on the checklist above and in Building a Carport Part 2 we reviewed 4 and 5. Now we will look at the remaining points. How to build a wood-free carport – this carport is described by eHow as moderately easy to build but lacks pictures and diagrams to assist. Free standing carport plans and construction details – I really like these plans from BuildEazy as they go into much more detail and include images of what you need to do. You will find this is a single carport with only a slight sloping roof. Be aware that some councils will require more of a slope. Note that this carport design comes in imperial and metric versions. Two car garage with either a frame or post construction – These are great detailed plans of a two car garage. You will find them on this site under number 5929 and 5930. It would be quite easy to adapt these plans to your own carport because they are so well done. 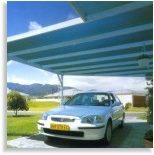 A shade cloth carport – A different idea altogether from DIY Site these are plans for how to construct a carport using shade cloth. Attached Carport – This design from Extreme How-To shows with plenty of instruction, diagrams and photos how to build an attached carport. Shade cloth carport from the DIY Site. For instructions on how to build this carport, see the link above. Most of these designs clearly list the materials that you will need in order to make the carport. The next step is to choose what timber and what screws you should use. If you are not used to building such structures it may be worth talking to your local hardware store. Seek out the appropriate expert to guide you as to what you need to consider when purchasing, but some of the items you might want to consider are whether there are issues with termites, longevity of the material (weather resistant such as treated wood and galvanised steel). Check out the DIY Bargain Bin for all your requirements as you can save a lot of money buying from one of our suppliers than purchasing direct from another timber supplier. It is now time to draw up your formal plans. Remember at this stage you should already be fairly comfortable with what the council will and will not allow. If you are not able to draw up the plans to the level of detail you may wish to hire an expert to do these for you. An example of how your plans must look is shown in the image below which was taken from Whitehorse Council’s (VIC) website. 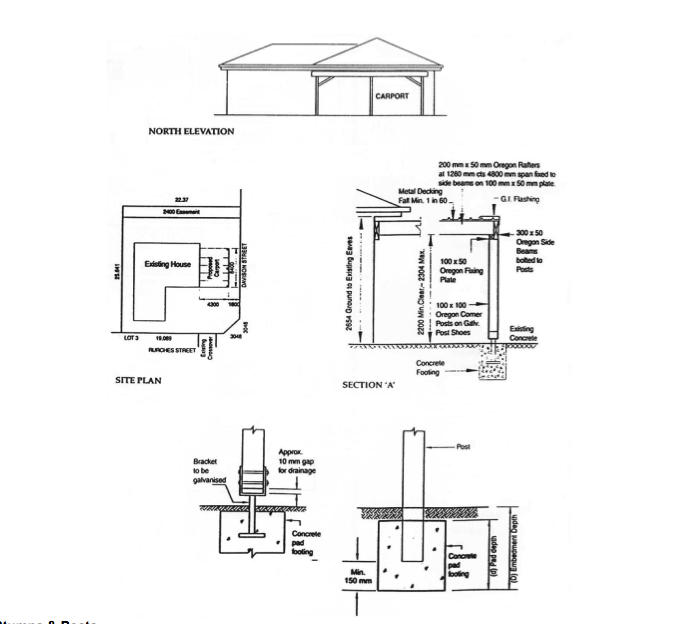 Sample plans for a carport sourced from Whitehorse Council's website. Check with your council on the exact information they want to see and what scale the diagrams should be. You are now ready to apply for approval. Once received you are ready to go ahead with construction of your carport.